Are you always looking for dishes that you can prepare for celebrations or parties and are suitable for a greater number of people? Then I have something that will taste all pizza lovers certainly for you today. 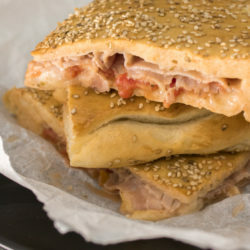 As a conclusion of the February series on street food, I'll show you another specialty of Sicily: Mattonella palermitana. While the popular filled Reisbällchen “Arancini” now also known in Germany, the Mattonella is here unknown, regional specialty. 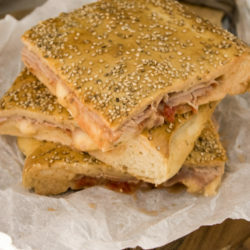 Imagine a merger of sandwich and pizza before, then you can imagine roughly what I'm dealing with. The name, translated what “tile” is, comes from the rectangular shape, in the cutting the special pizza bread. Served warm, it is certainly a hit at every party! 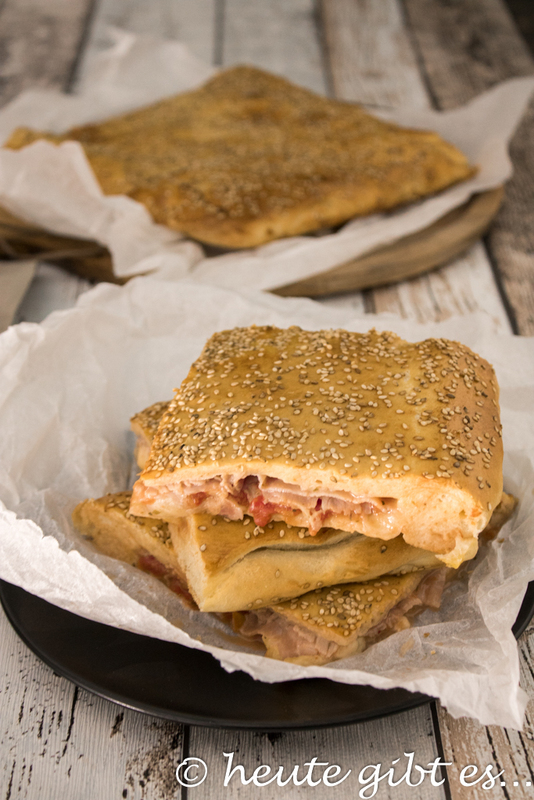 The basis for the Mattonella palermitana is a salty yeast dough. Now, if one or the other of you reading the word “yeast dough” equal gets sweats, so I want to reassure him. I can tell you a song of unleavened yeast doughs and other disasters hereby. But now I have some practice in and bake for example, my beloved pesto wreath even very much. When I but the traditional recipe from a “roaster” got from Sicily, I was a little confused, because here all the ingredients are simply mixed together and kneaded. You have neither heat a liquid, nor dissolve the yeast in it. I was skeptical at first, but it really works and is much easier than usual. This one gets safely even as a beginner very well there! Put all the ingredients for the dough in a bowl and knead for 15-20 minutes until a smooth, minimally sticky dough. Shape the dough into a ball and leave covered for about 2 hours in a warm place until it has doubled. crush and season with oregano and salt for about 10 minutes before the end of proofing time the fragmented tomatoes with a fork. Cut the mozzarella into cubes and set aside. 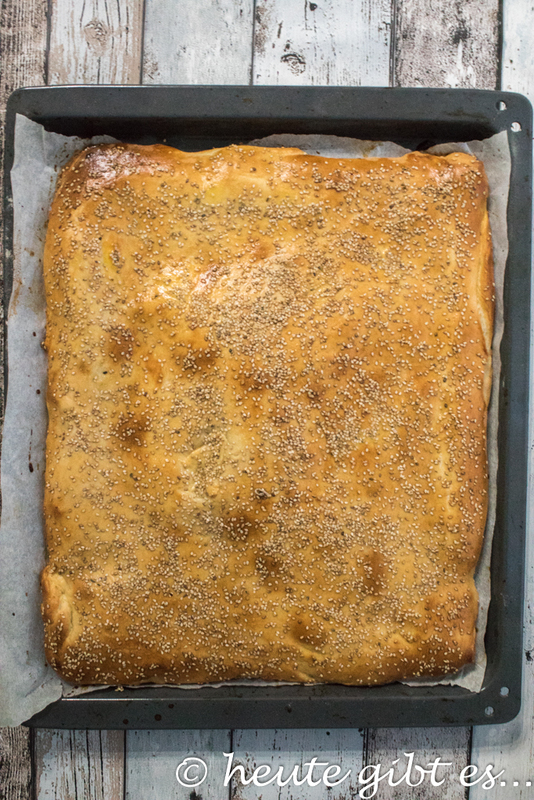 halve the risen dough, roll out a half with the corrugated timber to a baking sheet and place on the large rectangle lined with baking paper sheet. Preheat the oven in meantime to 200 ° C (fan). 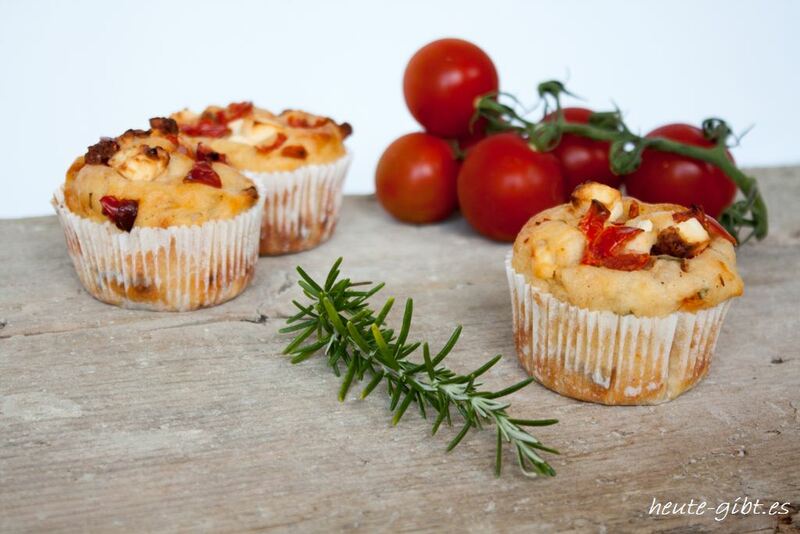 distribute the tomato mass evenly on the dough, with an approximately 2 cm wide edge is left free on each side. If your mass be too watery, some liquid poured off, so that the dough at the end do not get too soggy. Now the diced mozzarella and then distribute the ham on the tomato. 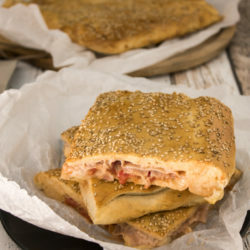 Subsequently, the second half of the dough also roll baking tray large, “Pizza” cover it and squeeze both halves on the edge. note here is that no air is trapped. Whisk in the end the yolk with the milk, the dough so Brush and sprinkle with sesame seeds. 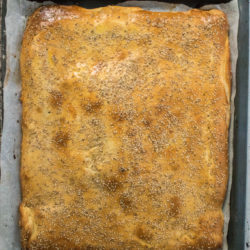 Bake the Mattonella in preheated oven for 15-20 minutes until golden yellow, then cut into squares and enjoy the best warm. 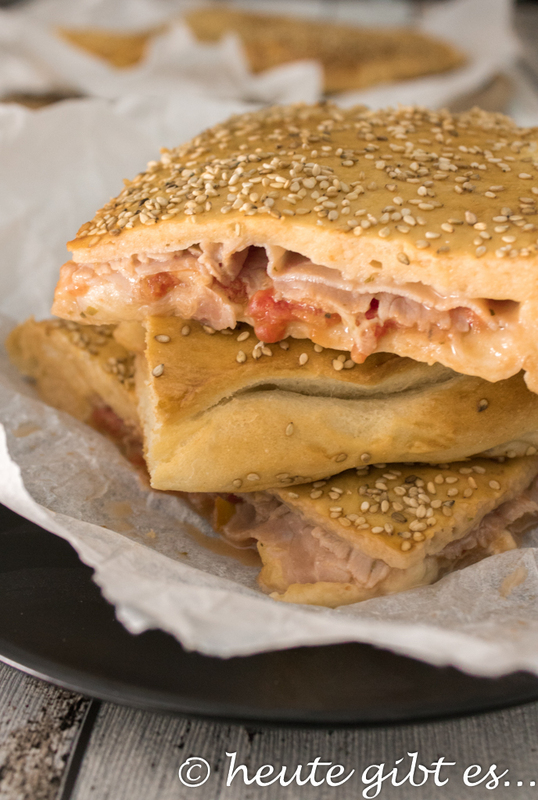 In the traditional version, the Mattonella filled with ham, cheese and tomato. Of course, you can also choose a different home stuffing according to your taste. just replace the vegetarian version of the dough to lard the same amount of tasteless oil. Freezing is not recommended for this recipe. If the Mattonella palermitana to your liking? 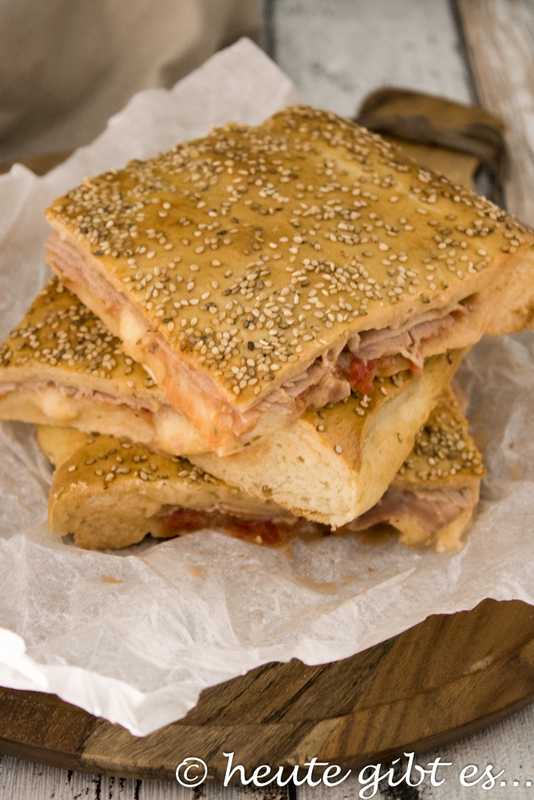 I myself have this always in Sicily – Incidentally, there are those outside of Palermo – eaten. 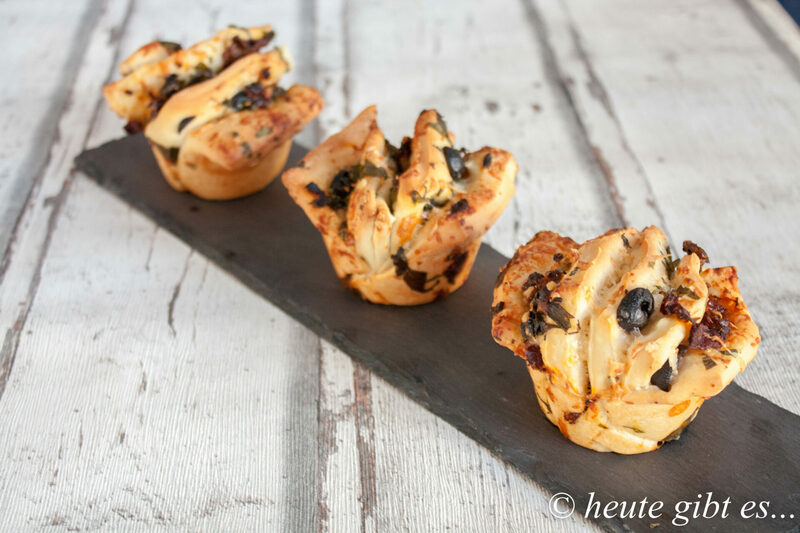 Thought this is actually as a snack or lunch, but can be very well served as an appetizer. This concludes officially the February series on street food in Italy and I hope that you were able to discover for yourself the odd dish. Do you have a favorite? Next week, there is then a new topic. 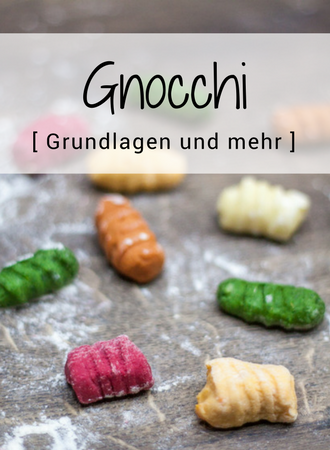 If you do not want to wait that long, but like Browsed among other posts my Blogreihe “Italian Kitchen – Learn all about…”. 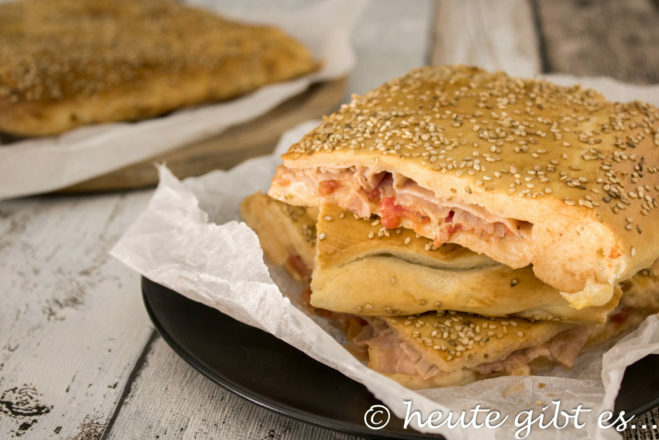 11 Kommentare zu "Mattonella palermitana – a tasty alternative to Pizza"
But now that's a nice recipe! A great alternative to Pizza 🙂 Do I have to try the day. Wow, that sounds as if it was to my taste !! Delicious! I imagine with tuna also great before! True, with tuna, I can imagine that very well! you can replace the lard by olive oil? If so, the same amount? I've probably not read accurately. The answer to my question is yes at the end of the recipe. I would use some tasteless oil, because olive oil has its own, often intense flavor. I just came across your blog. made great. The Mattonella is in the oven and I chose the vegetarian variation. Am happy to have discovered your site. I am glad total that you like the recipe and you've also tried it the same. The vegetarian option is of course ideal on Good Friday! I'm curious how it tasted you, let love to know me! wanted to tell you briefly that the Mattonella has all good. Only the dough was a bit too thick because I still have to work on it. I am pleased that it tasted you. If you remember the dough that is too much for your baking sheet, you can process a piece separately. For me it always fits. Um die Übersicht über Kommentare zu behalten und Missbrauch zu verhindern, speichert diese Website Name, E-Mail, Kommentartext sowie IP-Adresse und Zeitstempel deines Kommentars. Detaillierte Informationen dazu findest du in der Data protection.